This simple salad recipe is a virtual kaleidoscope of colorful fruits and veggies. It is a healthy combination of beets, red onions, blood orange, pomegranate seeds and arugula in a tangy pomegranate vinaigrette. Add walnuts for a satisfying crunch. Serve as a side or a quick and tasty lunch. RecipeSavants.com This simple salad recipe is a virtual kaleidoscope of colorful fruits and veggies. It is a healthy combination of beets, red onions, blood orange, pomegranate seeds and arugula in a tangy pomegranate vinaigrette. Add walnuts for a satisfying crunch. Serve as a side or a quick and tasty lunch. Smart Recipes, American Recipes, Vegetables,Nuts Recipes, Recipes Vegetables,Nuts American Beet & Pomegranate Seed Salad PT1H10M Serves 4 Ingredients: 4 Medium Beets 0.5 Cup Toasted Walnuts 3 Tablespoons Vegetable Oil 1 Teaspoon Salt & Fresh Ground Black Pepper 0.75 Cup Water 1 Large Blood Orange 1 Tablespoons Pomegranate Molasses 1 Tablespoon White Vinegar 1 Medium Red Onion 3 Medium Blood Oranges 1 Cup Pomegranate Seeds 4 Cups Arugula Preheat oven to 400 degrees. In a large roasting pan, arrange beets and drizzle with 1 tablespoon oil and toss until beets are coated. Season with 1/2 teaspoon salt & pepper and stir in 1/4 water. Cover with a sheet of aluminum foil and roast until beets are fork-tender, about 50 minutes. Allow to cool. Peel beets and slice into wedges about 1/4 inch thick. Set aside. In a large bowl, whisk orange juice, pomegranate molasses, vinegar and remaining oil until combined. Season with 1/2 teaspoon salt & pepper. In another small bowl, place onion and cover with 1/2 cup cold water and soak for 1 minute. Drain water and squeeze onion in a kitchen towel to dry. In the vinaigrette bowl, add beets, onion, oranges and pomegranate seeds and toss until combined. In a large serving bowl, add arugula and top with beet mixture. Gently toss to combine. Top the salad with walnuts. If you enjoyed this easy beet salad recipe, you'll love these fresh ideas. This beet, arugula, olive, shallot and feta salad is only dressed with olive oil to keep it light and to preserve the roasted beet flavors. If you prefer a more substantial dressing, this salad pairs very well with our lemon poppy seed dressing. Originally considered French “peasant food”, there is nothing paltry about the flavors of this dish! 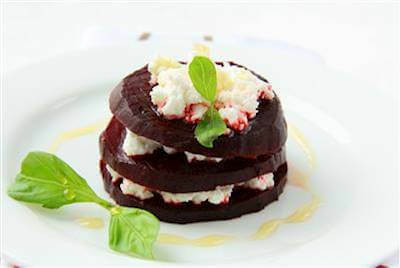 It is a mixture of sweet, tender beet slices, sautéed greens, and Swiss chard. Season it with salt, freshly-ground pepper, and a splash of white wine. It is marvelous when served with a mild cheese and warm baguettes. 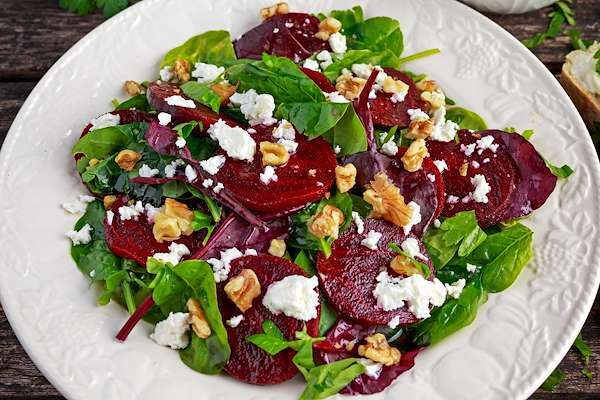 Let the beets shine by making this healthy salad that is gorgeous on a plate, for simple lunch recipes. Use hazelnut oil instead of the olive oil if you can find it, otherwise, olive oil works equally well. Pair with a American Black Ale. 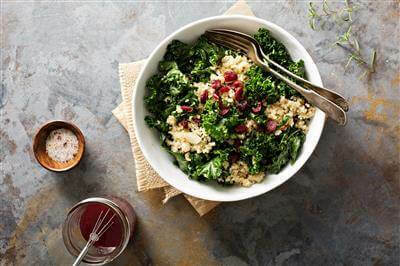 A crowd-pleasing picnic favorite, this salad showcases the delicious medley of wheat berries, quinoa, red lentils, broccoli, baby kale, pomegranate seeds, mint and cilantro leaves. The honey-mustard vinaigrette adds volume to this simple salad. This is a perfect simple salad course, or light lunch. Pair with a simple grilled chicken breast for a complete meal.